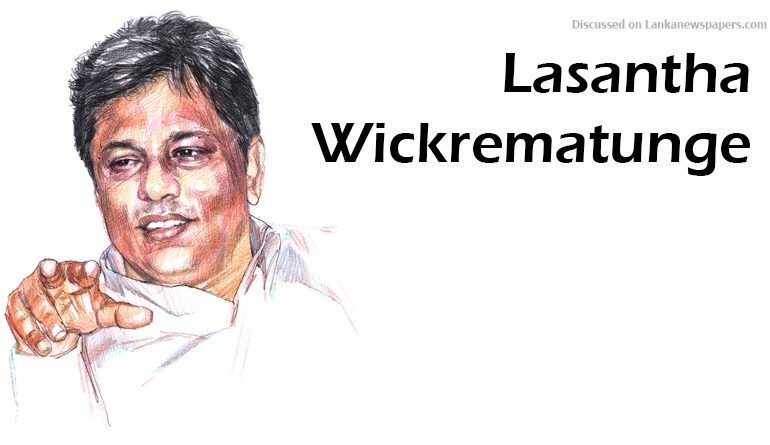 The CID had taken into custody the former Crimes OIC of the Mount Lavinia Police on a 48 hour detention order over the killing of Sunday Leader Editor Lasantha Wickrematunge which took place nine years ago. CID sources told the Daily News that the then Crimes OIC of the Mt. Lavinia Police, Sub Inspector Tissa Sugathapala was taken into custody on Wednesday by the CID and had obtained a court order to detain him for 48 hours for questioning. According to CID sources, many details that had hitherto not been revealed, had come to light during the interrogation of Sugathapala. He is accused of concealing and destroying information pertaining to the killing of Lasantha Wickrematunge. The CID said he had failed to respond to orders of the CID to record a statement with regard to Wickrematunge’s killing at Attidiya on January 8, 2009. The CID official said Sugathapala was scheduled to be arrested and remanded yesterday. It is also learnt that the CID intends to arrest a former IG, DIG, SP and several others on charges of trying to sweep under the carpet all evidence with regard to Lasantha’s killing and trying to pin it on the LTTE. Further, the CID is also expected to obtain a statement from a former high ranking government official who is believed to have been the main advisor in this crime. Information had also been revealed that Lasantha’s diary which had been found in his car at the time of his assassination, containing all his details, his mobile phone and several other items had been given by SI Sugathapala to an SP who had then given it to the DIG and then to the IG and eventually to the high ranking government official. This information had also come to light during the interrogation of SI Sugathapala.